This three-element, three-band HF beam antenna was designed in 1969 for amateur radio operators by a talented ham Victor Zakharov, UA3FU. Its design was first published in 1970 in April issue of Radio magazine. It is a pecu-liar coincidence that 1970 is also my year of birth. In real life we appeared to be almost neighbors and happened, that I would get acquainted with him and work with him as a radio amateur while designing his second version of this antenna. It had evolved to be a four-element antenna which was also published by him in February, March and April issues of Radio magazine in 1992. Together we accomplished tuning and measuring radiation pattern of the antenna on the roof of his home near Novogireyevo. Beacon signal was received from Perovo at 2 km distance. I remember that we had to lower the telescopic mast quite often for tuning each centimeter of passive elements. Once the mast guy wire broke and the antenna fell on the roof. Luckily, it did not fall on our heads. However, a week later it was repaired and we could continue our work. In the evening time I frequently visited to Victor and with great pleasure listened to the bands at his station. At the same time I was fascinated with the clean radiation pattern and other marvels of antenna technique. Wonderful wizard of antennas, UA3FU, has long ago left us. However, his designs live with us. After 40 years I am happy to repeat one of his designs and offer my ham brothers an industrial version of such an antenna. Efforts to go over to serial production took a long time. I rejected first prototype because of its too low mechanical durability. For this reason the boom was changed in a quadrangular box tube and elements chosen to be of larger diameter. Trap design was also somewhat improved: stop screws were added for better contact. In other aspects the design was left as it had been earlier. As the author himself put it, this antenna design needs accurate tuning of the radiation pattern. 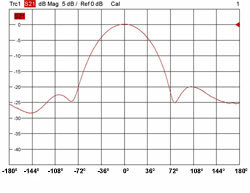 In our factory hav-ing modern measuring equipment all traps go through a tuning process for correct resonant frequency. As a result, there is high probability of getting the sought-after radiation pattern. Considering the fact that the antenna has a short boom and the elements are shortened by traps, expecting ex-tremely good results is not reasonable. This beam antenna is good in its own category of antenna designs. In the near future we hope to introduce a 4-element beam antenna UA3FU with a more pronounced radiation pattern. At this time we offer you this beam antenna Y3-FU with radiation patterns presented below. Concluding my presentation, I would like to note that the author in his design did not complicate the matching cir-cuit but kept it to the usual 1:1 balun transformer for lowering losses and simplifying construction. And so did we. I am thankful to destiny for guiding me to meet my first antenna teacher Victor Zakharov, UA3FU. I would be happy to see that his antenna designs would continue to shine on our roofs making hams happy. Construction of Y3-FU beam antenna has two passive elements, director and reflector, and one active element which is the driven element. The latter is split and mounted on insulators. It is fed by coaxial cable through a 1:1 balun transformer. Each element consists of a central tube, traps and outer tubes. Principle of operation of the antenna is based on the ability of the traps to electrically block out all conductors located on the far side of the load (generator). 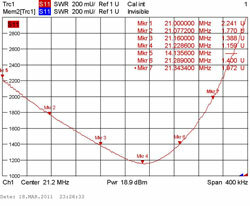 The inner filter is tuned to 28 MHz band and the outer filter to 21 MHz band. 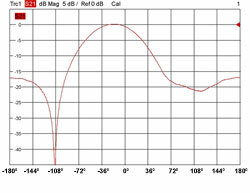 Furthermore, in each element the cut-off frequency of the filter is different and corresponds to frequencies given in Fig. 3.2. 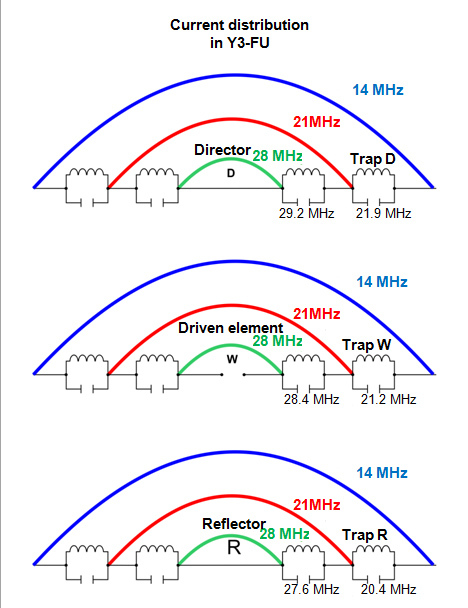 On 28 MHz band only inner parts of the elements have a role in forming the radiation pattern, since the 28 MHz filter cuts the current path thus making for the signal invisible everything that lies behind the filter. 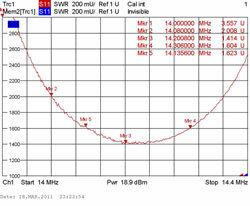 On 21 MHz band the coil of the 28 MHz filter acts to lengthen the element. It is connected to the outer capacitor tube of the trap and also serves to lengthen the radiating element. This element stops at the 21 MHz filter, consisting of coil and tube capacitor. 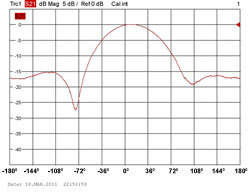 Following tubes D14, W14 and R14 do not play any part in radiation of the antenna on 21 MHz band while on the input they see high impedance of 21 MHz filter. 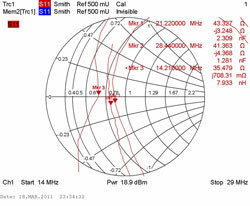 record of admission to the range of 20 m with the antenna rotation Y3-FU. 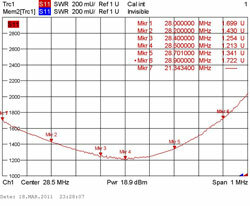 pattern antenna Y3-FU on 20m.